Excel is a great program to use if you don’t require complicated graphs and if you use their default formatting (which you shouldn’t!). However, if you need more advanced formatting, making graphs in Excel can become complicated. It’s not impossible though — there are ways to manipulate Excel to create beautiful, custom charts. Finally, apply the formatting to all your data by highlighting the cells containing your IF statements and dragging the blue box in the lower righthand corner all the way down to the end of your data. At this point, you can create whatever type of graph you need — this conditional formatting technique can be used to create a wide variety of graphs. 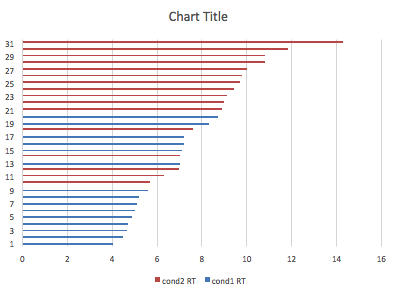 In this example, I created a simple bar chart to visualize subjects’ response times according to condition type. To create a bar chart, click on the charts tab in the Excel ribbon. Highlight the data in the new columns you just created (the columns with the #N/A values), click on the Bar icon, and select clustered bar chart. Now when you click on a datapoint in the graph, it will highlight all of the other datapoints that belong to the same condition. You can format the datapoints in each condition separately.